Paradise on Bumi is a utopian city built by the Forlorn. It hides a terrifying secret that dictates the fate of many. 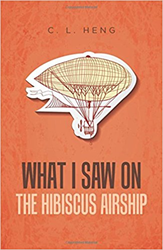 Arla Hibby, a young girl who lingers in a past she wants to forget, will be tangled in a quagmire of dangerous events that ultimately leads her onto the Hibiscus Airship. On the airship, her true destiny awaits. In the author's imagination, Bumi is metaphorical representation of the author's country of birth. “The Hibiscus Airship” is an idea of what Malaysia could be if it had the courage to imagine. But they knew that time was an independent factor that kept everything under a constant cycle of change. Their bond built through countless years of hardship would soon be broken to the natural limitations of physical cessation. The obsession to search for a fountain of youth would bring disappointment when people comprehended that immortality worked in a unique way. C. L. Heng is an engineering management professional who believes in the need for storytelling. With a desire to see the world moving forward with a bright imagination, Heng dove into literary abyss hoping to find redemption in our future. He lives in Kuala Lumpur, Malaysia. Partridge Singapore, an imprint in partnership with Penguin Random House Singapore, aims to help writers in Singapore, Malaysia, and the rest of Southeast Asia become published authors. Partridge Singapore gives authors in the region direct access to a comprehensive range of expert publishing services that meet industry standards but are more accessible to the market. For more information or to publish a book, visit http://www.partridgepublishing.com/singapore or call 800 101 2657 (Singapore) or 1 800 81 7340 (Malaysia). For the latest, follow @PartridgeSG on Twitter.